Astronomers detected the smashup using X-rays, not gravitational waves. This bright burst of X-rays, observed by NASA's Chandra X-ray Observatory, was likely generated by the collision of two neutron stars 6.6 billion light-years from Earth, a new study reports. NASA's Chandra X-ray Observatory detected a powerful burst of X-ray light coming from a galaxy 6.6 billion light-years from Earth, a new study reports. The emission, researchers said, was likely generated by the merger of two neutron stars, exotic stellar corpses so dense that their constituent matter is squished into neutrons. 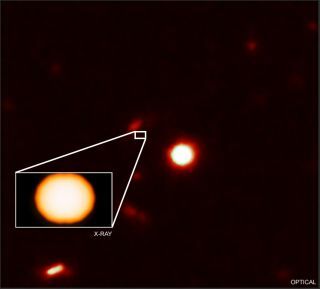 "We've found a completely new way to spot a neutron-star merger," study lead author Yongquan Xue, of the University of Science and Technology of China, said in a statement. "The behavior of this X-ray source matches what one of our team members predicted for these events." The light source Chandra studied, dubbed XT2, flared up on March 22, 2015, but the research team saw it later after going through the observatory's archival data. XT2's X-ray brightness remained relatively constant for 30 minutes. But that brightness dropped by a factor of 300 over the following 6.5 hours and then faded away entirely. This X-ray signature, the researchers said, matches that of a newborn magnetar, a fast-spinning neutron star with a magnetic field about a quadrillion times more powerful than Earth's. So, it appears the XT2 neutron-star crash created a magnetar rather than a black hole, just like the 2017 event (which is known as GW170817, because it was first spotted on Aug. 17, 2017). The new study should help astronomers learn more about the interior structure of neutron stars, team members said. "We can't throw neutron stars together in a lab to see what happens, so we have to wait until the universe does it for us," co-author Bing Zhang, of the University of Nevada, Las Vegas, said in the same statement. "If two neutron stars can collide and a heavy neutron star survives, then this tells us that their structure is relatively stiff and resilient." XT2 probably generated gravitational waves as well, the researchers said. But the event occurred before the launch of the upgraded version of the Laser Interferometer Gravitational-Wave Observatory (LIGO). That project, along with a sister effort known as Virgo, spotted the space-time ripples from GW170817. And XT2 is probably too far away to be probed by LIGO anyway, study team members said. If XT2 is indeed a neutron-star merger, it's a member of a very select group. But there may be others of its kind lurking undetected in Chandra's archives. "We've started looking at other Chandra data to see if similar sources are present," co-author Xuechen Cheng, also of the University of Science and Technology of China, said in the same statement. "Just as with this source, the data sitting in archives might contain some unexpected treasures." The new study was published last week in the journal Nature. You can read it for free at the online preprint site arXiv.org.